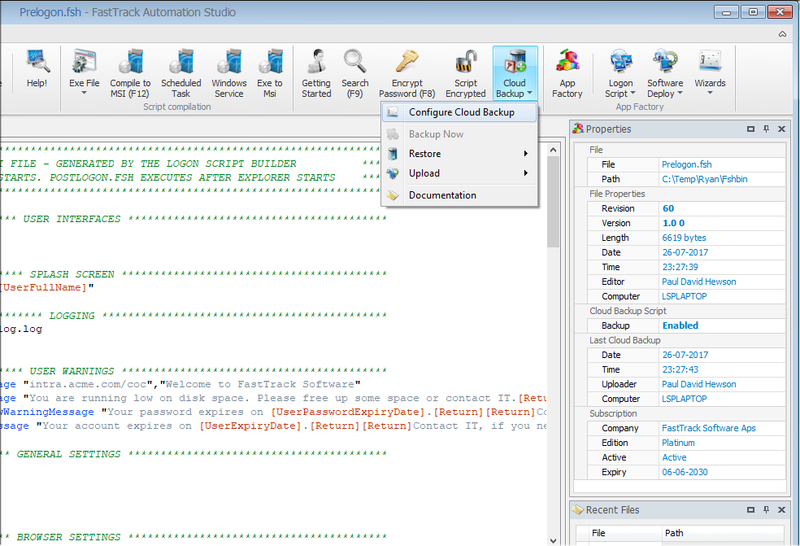 As part of your FastTrack Automation Studio subscription, you get free cloud backup storage for your Logon Script and Software Deployment configuration, signature templates and scripts build using the Script Editor. The backup also includes previous versions and tracking of who made the changes. Just set a checkmark and the backup is enabled. Your account will automatically be determined through your license key. If you are a consultant working for a customer, the cloud backup can also be used to easily access current configurations without access to the customer's network. The service automatically backs up your FastTrack files when you save and exit the Logon Script Builder, Software Deployment Builder, Signature Designer or close a script in the Script Editor. The reason the backup starts on close and not every time you save, is simply to avoid hundreds of meaningless intermittent backups before you have your final file. You can manually use the "Backup Now" menu item in any of these modules to manually trigger a backup without closing. We keep every version you backup for two weeks. After two weeks, we keep the newest version from each day. After one year, we no longer keep backup versions - except of course, if the most recent version of any file is more than one year old. In the Logon Script Builder, you activate the backup by checking the setting below. 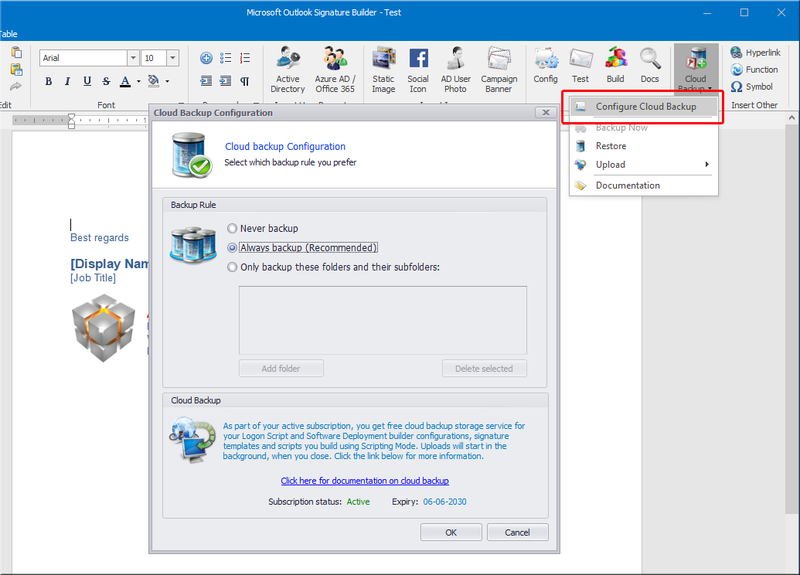 This setting is saved in the configuration file itself, ensuring that if anyone else opens the same configuration on another machine, the backup is automatically activated to ensure both the backup itself, but also tracking of who made the changes. When you look at the backup files online, you will see the name and time of who made the edits to the configuration. Further down this page, you can see what the logon script restore page looks like. This means the backup does not include the fsh.exe file, your license file and any other files you may have put in the fshbin folder manually. To restore a logon script, start the setup from scratch using the Logon Script builder. Then unpack the restored files to the fshbin folder and overwrite all files. You now have an identical setup as before. 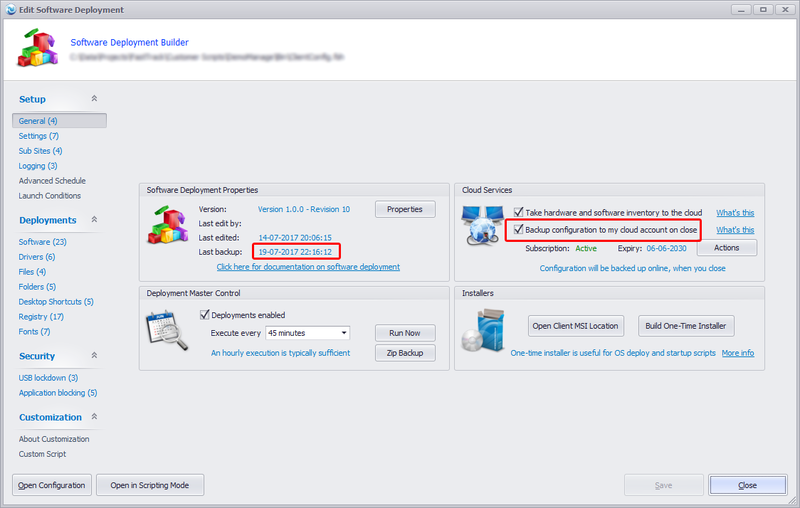 In the Software Deployment Builder, you activate the backup by checking the backup checkmark the same way as with the Logon Script Builder. As with the Logon Script Builder, this setting is saved in the configuration file itself, ensuring that if anyone else opens the configuration on another machine, the backup is automatically activated to ensure both the backup itself and tracking of who made changes. The backup does not include custom files nor the files you reference from the builder. It only backups up the configuration itself, meaning the ClientConfig.fsh file from the main site and any sub sites you might have. The backup does not include your setup files, drivers, fonts, log files and any additional files you may have put in the Software Deployment "Bin" folder. To restore a configuration, run the deployment wizard from scratch and then restore and overwrite the ClientConfig.fsh file(s) from the backup set and you have an identical setup as before. There are two ways you can start the Signature Designer. If you open it through the Logon Script Builder and the logon script has the backup enabled, the Signature Builder will automatically enable it. If you do not have this setting enabled in the logon script or you start the designer directly from the Home Screen, you must enable the backup as shown below. When you enable the setting, signature files will be uploaded to the backup storage when you close the designer (assuming the signature was changed). If you have backup disabled and you open a signature that was saved by someone else with backup option enabled, you will get a warning. The backup setting is stored in the signature file, so the backup "follows the signature" and no backup is missed because it was edited by someone else. At the footer of the window, properties for the document are shown. The version and revision can be set using the "Version" menu at the top. If you want to start a manual backup, use the "Backup Now" menu item in the Cloud Menu at the top. In the Script Editor, you enable the cloud backup at the top tool bar, as shown below. If you enable the setting, scripts will be uploaded to the backup storage when you close a script window (assuming the script was modified). The reason it uploads on close is to avoid hundreds of meaningless backups every time you run a script to test it. If you need to do a backup during editing, you can use the menu item "Backup Now" at the top menu. You can see the last upload time in the Properties pane on the right side, as shown below. If you have existing scripts, you need to upload one time, you can select the menu item "Upload Directory" under the "Monitor" submenu. The backup setting is stored in the .fsh file itself. This is to ensure, when the backup is enabled, someone else cannot unintentionally edit the file without a subsequent backup. If you have the cloud backup disabled and you load a script that has the cloud backup option enabled by someone else, the editor will ask you to change your settings. This ensures that the backup "follows the script" in scenarios, where multiple administrators modify the same scripts or when the studio is installed on a new computer and the backup option is off (which is default). If you want some insight as to what was backed up when, you can use the "Upload" menu, as shown below. Here you have two menu items. One goes to your account online on this web site, where you get the full picture of all edits/uploads from everyone on the file you have open. The other will show you all upload traffic from your own computer. To restore, use the top menu on this page. Select "My Account" and select the left restore menus. If you do not remember your password or are having trouble restoring files, please contact us using the "Contact" menu at the top and we will help you.